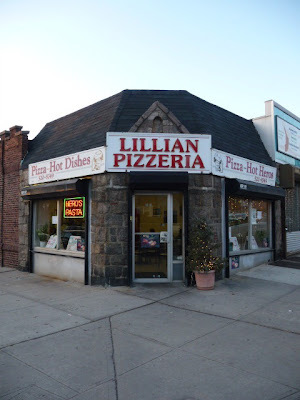 Probably Forest Hills' best kept secret (at least for pizza) is Lillian. All tucked away on 69th between the Gardens and Yellowstone, its resides just a few steps away from Forest Hills' other best kept secret (at least for vino), the Wine Room. 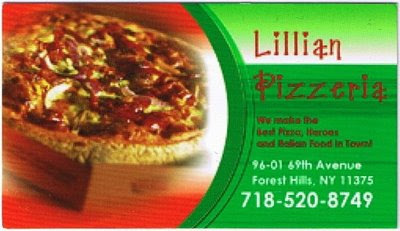 Lillian is a somewhat small, traditional pizza place, with it's 1980s chairs and long-faded press clippings, catering primarily to Arbor Close, the west Gardens, and the school kids from across the street. Oh, and apparently to Ray Romano. It's great pizza. I mean, really great pizza. See, I'm usually content with whatever red sauce slice is nearby when I'm hungry, but there are times when I just want a Lillian Slice. The sauce is sweet, the cheese is perfect, and oil the temperature of molten lava doesn't pour down the back of my hand when I do that quintessential New York pizza thing, the fold-and-walk. You can't really describe great pizza to a New Yorker. We've had too much of it and the pies out there are so very similar that words are just meaningless vibrations. We need to experience that little pause, that simple raised eyebrow after you bite in where, for a split second, you realize that this is just better than the other guys. Besides pizza, Lillian has other menu options. Garlic knots, broccoli pinwheels coated in huge chunks of garlic, eggplant rolls, and chicken rolls. Most recently, I stopped in and grabbed a Chicken Roll and a Broccoli Pinwheel. Both were excellent. A little crust, but not too much, soft cheese, sauce on the inside, the chicken not drowned out by the dough. I also tried the Lasagna, which was decent. I wasn't expecting much, and was pleasantly surprised. Way too much sauce though. It was practically swimming in it. Lillian has its downsides, and I'm not about the avoid pointing them out just because I love their end product. First, convenience. It's not near anything. As with the Wine Room, you make the active choice to go there because it's just that good. Second, if Lillian's physical space is small, then their selection is smaller still. While Ariana and Mike's might have a dozen or so varieties of pie, Lillian has maybe three, varying by the day. Plain cheese, random 1, and random 2. On my most recent trip, random 1 was broccoli and random 2 was tomato and garlic. Large cuts of tomato, big huge chunks of garlic. But that was it. Very limited options. The employees, I'm willing to put money on, are the same ones from when Lillian opened in 1971, from the three guys who work the front and cook the pizza (They might want to hire and apprentice soon), to the temperamental woman who runs the place. Although there's one guy who basically grunts when you order a pie like he's doing you a favor, she's the one to worry about. One minute, sweet as pie. The next... let's say that at least twice, she's barked at me for sitting at a table that she had just cleaned. 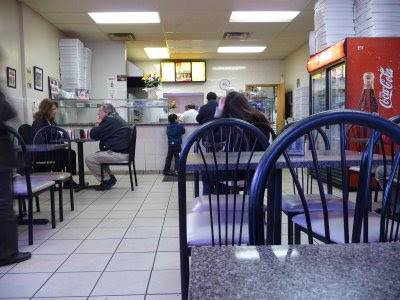 Still, is it fair to say that little Lillian, known by almost no one, is one of the best pizza places in New York City? Yes. It's very fair to say such a thing.